The inspirations for our architectural tiles come from our favorite things - Arts & Crafts interiors, Louis Sullivan and Greene & Greene buildings, and all that nature has to offer. Once an idea captures our imagination, we determine a desired scale and sculpt an original clay tile or set of tiles. The tools used at this stage are the ones artisans have been using for hundreds, if not thousands of years. We strive to capture the smallest of details resulting in the process taking up to several weeks. Glazing can be as simple as selecting one beautiful shade that showcases the intricate pattern of a Celtic tile. It can be complicated by masking out branches or leaves on an Arts & Crafts tile to allow them to be a contrasting color. Or a tile can have the many colors of a Moorish Pattern that need to be carefully applied with the most delicate of droppers. 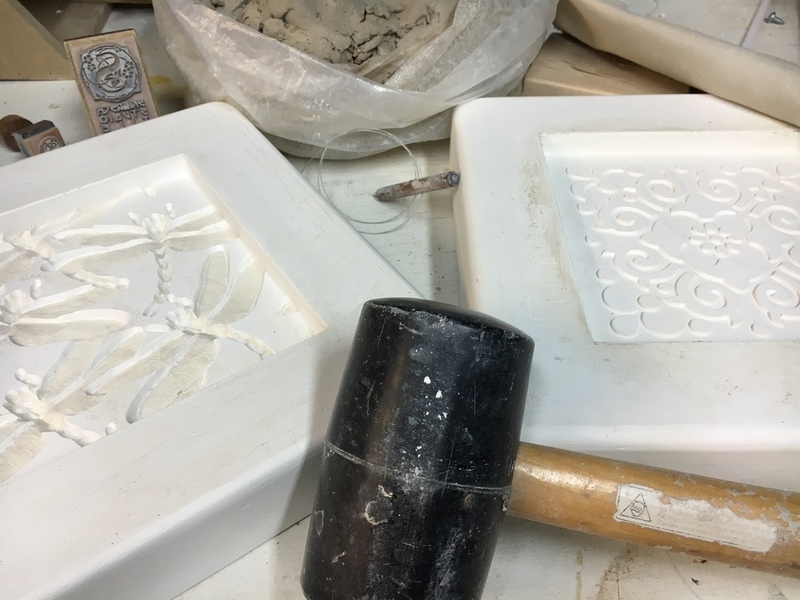 After glazing, the tiles are once again fired, this time at a higher temperature, to liquefy the glazes and bring them up to their final brilliance and durable imperviousness. To enable the duplication of the original sculpted tile, a plaster cast is carefully made of it to create a negative space version of the tile. Fresh clay is then pressed into the void in the plaster to form a new tile, identical to the original. This process is repeated - one tile at a time. Tiles are then bisque fired. Layout drawings are very important to the successful installation of any project and will be provided as requested. It is crucial to account for the proper grout joint dimensions and to allow tolerances for field conditions. Skiersch Studios does not provide installation services. We will coordinate with your finish carpenter to determine the correct field dimensions and calculate the adequate quantity of tiles needed to account for field cut tiles. We do everything possible to ensure the final product lives up the vision of the initial design.